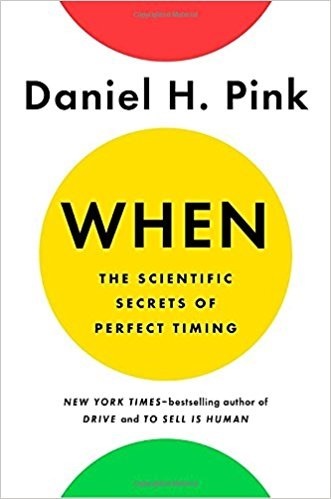 When: The Scientific Secrets of Perfect Timing by Daniel H. Pink takes on the hidden science of timing and how it impacts our lives. There is solid advice here that applies all of us at work, in school, and in our leisure time. Be sure to get your own copy and consider giving one or more as gifts. Also see my summaries of Dan’s other fine books Drive: The Surprising Truth About What Motivates Us and To Sell is Human: The Surprising Truth About Moving Others. We all know that timing is everything, but we don’t know much about timing itself. Our lives present us with a never-ending stream of when decisions. Rather than being a how-to book, this is a when-to book. For content, Daniel and two other researchers analyzed more than seven hundred studies in the fields of economics, anesthesiology, anthropology, endocrinology, chronobiology, and social psychology to unearth the hidden science of timing. Get ready for a lot of science. This chapter focuses on our biological clocks or circadian rhythms. The research assembled here shows that about two-thirds of us are morning people (larks), while the rest are more productive later in the day (owls). There is a test here that can help you figure out which one you are. The message here for bosses and teachers is that the type of work or problems you expect workers and students to engage in should be dependent on their chronotypes and the time of day. No matter which type you are, you are likely to experience peaks and troughs. At the end of this chapter is the first Time Hackers Handbook. Each chapter has its own version. Here Dan discusses when to exercise based on your goals and tips for a better morning. There is a lot of research that shows that we perform worse just prior to lunch or near the end of the day. The answer is to take periodic breaks away from your desk. This is especially true for low performing students. Breaks should involve movement and detachment from your work or study. Having conversations about non-work topics with others helps as does walking outside. Although we often hear that breakfast is the most important meal, it is not well supported by research. There is evidence that how you do lunch can make a difference. Unfortunately, too many people eat lunch at their desks. Like other breaks, your lunch break should involve moving to somewhere else and detachment from your job. Naps are also an excellent way to ramp up productivity, but not just any nap will do. The optimum length is between ten and twenty minutes. One way to promote this is to take caffeine in some form prior to your nap. It won’t kick in for about twenty-five minutes so it will help you get back in the game. Innovative companies are creating nap spaces for their employees. The hackers handbook here offers advice for schools. 1. Schedule recess before lunch. 2. Don’t structure recess. Let kids negotiate it themselves. 3. Include mid-morning and mid-afternoon breaks where students move about. 4. Make sure teachers get breaks too. 5. Do not deny recess as a consequence of bad behavior. This entry was posted on Monday, February 12th, 2018 at 7:48 am	and is filed under Book Summaries, Business Books, Education Books, Leadership Books. You can follow any responses to this entry through the RSS 2.0 feed. You can leave a response, or trackback from your own site.